Here is the weekly review of the top performing Angolan players, who play currently abroad. #1. 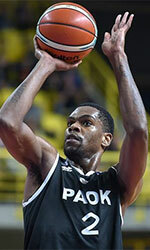 This week's number one is an international center Yanick Moreira (211-91, college: SMU, currently plays in Italy). He contributed to a Virtus Bologna's victory against the closely-ranked VL Pesaro (7-17) 78-70 in the Italian Serie A in Sunday night's game. Moreira scored 9 points and grabbed 7 rebounds in 16 minutes on the court. Virtus Segafredo Bologna (12-12) is placed 11th in the Serie A. This year Moreira averages: 8.4ppg, 7.0rpg, 2FGP: 59.0%(36-61) and FT: 52.2% in 10 games he played so far. He is currently a member of the Angolan senior national team. #2. Second place goes to former international guard Edmir Lucas (191-93, currently plays in United Kingdom). Lucas could not help London CR (13-9) in their last game on Saturday. Despite his good performance London CR was defeated 97-90 at home by the lower-ranked Newcastle Eagles (#7). Lucas scored 13 points and grabbed 4 rebounds. It's Lucas' first season with the team. His overall stats this year are: 9.7ppg, 2.9rpg, 2.6apg, 2FGP: 52.6%, 3FGP: 45.1%(37-82) and FT: 63.6%. Lucas has a dual citizenship: Portuguese and Angolan. Former Desportivo 1. De Agosto Luanda starter played for the Angolan national team in 2017. #3. The Angolan player who performed third best last week abroad was former international forward Antonio Monteiro (204-89, currently plays in Portugal). He helped FC Porto win their game against the sixth-ranked Terceira (10-15) 96-87 in the Portuguese LPB on Sunday night. Monteiro scored 7 points and grabbed 9 rebounds in 17 minutes. FC Porto (19-6) is placed third in Places 1-6 group. It was his team's sixth consecutive victory in a row. This year Monteiro's overall stats are: 4.5ppg, 4.3rpg, 2FGP: 47.2%, 3FGP: 28.6% and FT: 47.5% in 22 games. He is another player who holds two passports: Angolan and Portuguese. Despite Monteiro played previously for the Portuguese U20 national team, he played also for the Angolan national team in 2014. #4. Forward Julio De Assis (203-92, agency: Duran International, currently plays in Spain) was the major contributor in Univ.Burgos' victory against the eighth-ranked Santurtzi (10-13) crushing them 96-70 in the Spanish EBA (fourth division) in Saturday night's game. De Assis scored 17 points and grabbed 4 rebounds (went 6 for 6 at the free throw line). CB Universidad de Burgos (20-3) is placed second in Group A-A. It was his team's fourth consecutive victory in a row. There are only three games left until the end of the Regular Season. So now every game will be critical. De Assis has individually a very good season with high stats. He averages: 20.6ppg, 7.8rpg, 2.4apg and 1.3spg. De Assis has both Angolan and Spanish nationalities. He is also Angolan national team player. #5. Former international center Valdelicio Joaquim (208-90, also represented by Duran International, college: Hawaii, currently plays in France) was not able to help Quimper UJAP in their game against ALM Evreux (10-14) in the French ProB (second division). Despite his good performance on Friday night Joaquim scored 11 points, had 7 rebounds and made 2 blocks. Joaquim has relatively good stats this season: 13.5ppg and 7.4rpg. He used to play for the Angolan national team two years ago. #6. An experienced forward Jose Miguel (185-85, currently plays in Portugal) helped Electrico FC win their game against the second-ranked Sport Lisboa Benfica B (12-13) 89-80 in the Portuguese Proliga (second division) in Sunday night's game. Miguel scored 7 points in 30 minutes. Electrico FC (10-14) is placed fourth in Group B. There are only three games left until the end of the Second Stage. So now every game is very crucial. This year Miguel's total stats are: 8.9ppg, 4.1rpg and 1.1spg in 18 games. He is a former university international player as he played for the Angolan team twelve years ago. #1. Experienced Benedito Suca (196-F-84, currently plays in Portugal) was the major contributor in Academia's victory against the seventh-ranked Academica (13-12) 88-86 in the Portuguese Proliga (second division) last Saturday. Suca scored 23 points and grabbed 4 rebounds in 37 minutes. Academia do Lumiar Lisboa (18-7) is placed third in Group A. There are only three games left until the end of the Second Stage. So now every game will be critical. Suca is one of the most experienced players in a team as it's his eighth year in Academia's roster. He has relatively good stats this season: 13.8ppg, 6.2rpg, 1.3apg and 1.1bpg in 25 games he played so far. Notice: The list above includes only some of the Angolan playing currently abroad. 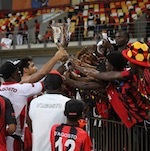 Go to Angolan Abroad Page to see completed list.